Concern over the potential impacts of the proposed Pilgrim crude oil and gas pipelines has prompted 58 towns, cities, and counties in New York and New Jersey to go on record opposing the project, with the majority of New York towns and counties challenging the New York State Thruway Authority’s intention to be the lead agency overseeing an environmental review for the pipeline. A growing number of environmental groups and local municipalities want the New York state Department of Environmental Conservation to be lead agency on Pilgrim Pipeline project. 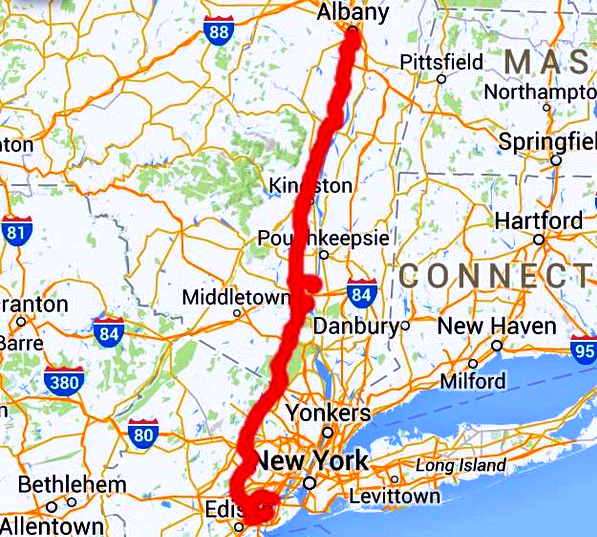 Pilgrim Transportation of New York’s proposed 178-mile Albany-to-Linden, New Jersey, pipeline has triggered mass reaction. New York’s State Environmental Quality Review Act requires that affected municipalities were to respond to the Thruway Authority’s bid for lead agency by December 16th, 2015, 30 days after receipt of the Authority’s letter indicating its intent. The deadline has passed. Kate Hudson is Riverkeeper’s Director of Cross-Watershed Initiatives: "That’s an amazingly short period of time for local government to act." The cities of Albany, Kingston, and Newburgh; the counties of Albany, Greene, Ulster and Rockland along with several towns in the counties of Albany, Greene, Ulster, Orange and Rockland are on record stating they believe the Department of Environmental Conservation, not the Thruway Authority, is the most qualified agency to lead the environmental review of the pipeline project. At Wednesday night's meeting of the Greene County Legislature, Arielle Herman of Catskill told lawmakers about the impact the pipeline has so far had on her: "Pilgrim agents approached me about well over a year ago, soon after I purchased a property on Old Kings Road in Catskill, and what they wanted from me was to use my property to build a construction road for building a pipeline. I had told them not only that I'm not gonna give them access to build a road, but that I'm not giving them any permission to set foot on my property ever, for any reason. When the permit applications for the New York State Thruway Authority came out however, the map showed a construction road going back through my property. So it seems clear that they plan to try to condemn my property for eminent domain, and it seems clear that they're willing to do that to anybody who is not willing to accept their offers of financial incentive. I have also since learned that having the pipeline on or even near your property would devastate property values, and this is something I felt was really important to bring up to the county, because it could devastate the entire county's tax base." Riverkeeper was quick to join the list of municipalities according to Hudson. "Many of these towns, in fact, and counties, had already passed resolutions in opposition to the pipeline altogether. But they in addition now have called for, in an almost universal voice, for the DEC to take over the environmental review." The DEC did not respond to requests for comment in time for broadcast. Hudson says the DEC has been "absolutely silent.” "Technically speaking, they did not get this issue yet in front of them. They are an involved agency but they don't get to, they are not required to make a decision about who should be lead agency, and so the disagreement over who should be lead agency is formally referred to them. It is our understanding that Pilgrim intends to write the DEC now and ask the DEC to determine who the lead agency will be in this environmental review, and that will trigger a 20-day time period in which DEC has to respond." A Pilgrim spokesman tells WAMC that DEC will likely become involved in the process at some point, but the company thinks the Thruway should be lead agency because 80 percent of the pipeline runs through Thruway property. Herman says whatever happens, the dangers are increasing now that the ban on exporting American crude oil is being removed, giving Pilgrim a huge opportunity to use the pipeline as a cash cow. "They have claimed that the reasons for the pipelines are to improve the energy structure of the Northeast. That just seems very, very unlikely, especially now that the oil ban has been lifted." She contends the pipeline will have no affect on the number of oil trains rolling through upstate, and urges fellow citizens to read Pilgrim's website. "You can read every bit of information on the website, and nowhere on that website does it say that even claim to take a single bomb train off of the tracks. That's because there is not a single bomb train that goes from Albany to Linden, New Jersey. The oil that goes between those two locations is all on barges. So not only would they not only be taking a single bomb train off of the tracks, but in fact, in order to get the Bakken crude from North Dakota to the mouth of the pipeline in Albany, they're gonna need trains. So the number of bomb trains going INTO the Albany area, are gonna grow immensely." The Thruway Authority did not return a call for comment. An environmental group claims a company that wants to construct a crude oil pipeline between Albany and New Jersey is harassing homeowners in New Jersey to move the project forward.